It is unfortunate when something famous and well-known in a library overshadows the existence of other objects which are also deserving of attention, and in some cases more so. In the Bodleian therefore, we must not let the recent discovery of the Selden Map blind us to the existence of other pre-modern Chinese maps in our collections that are also of considerable interest. Admittedly our collection of such maps is small – only 10, by contrast with the huge collection of over 500 in the British Library – but all of them are unusually interesting in one way or another, and a few are unique surviving copies. Some of them were included in Li Xiaocong’s 李孝聪 bilingual Descriptive catalogue of pre-1900 Chinese maps seen in Europe (Peking, 1996) made largely on the basis of trips here during the early 1990s. I must have been away when he visited Oxford, or I would have ensured that he saw all ten of our maps, and not just the six that are included in his catalogue. In fact I made a list of them very soon after my arrival in the Library in 1976, as it was clear that most of them needed conservation work of one sort or another. 歷代分野輿圖古今人物事跡, 1679, Sinica 92 (p.157). 廣東全省圖, 清乾隆中, Sinica 2733 (p.331). 乾隆今古輿地圖, 清乾隆中, Sinica 113 (p.169). 大清萬年一統天下全圖, 1767, Sinica 2734 (p.173). 大清萬年一統天下全圖, 1814, Sinica 2731, (p.193). 黃道中西合圖 北極﹑南極 (二幅), 1834, Sinica 875, (p.136). [東西洋航海圖], 1620s. MS.Selden supra 105. 皇輿地圖考 ; 通華經緯圖考 (二幅), 清康熙中. Sinica 123. The first of these, MS.Selden supra 105, is the newly famous Selden Map of China. It has no title, and I have taken its Chinese name from one of the articles that have recently appeared on it. And Sinica 2111 is not identical with a map of the same name listed by Li (p.186). If my blog continues for long enough, I hope to have something to say about each of our maps. For now I will discuss only the last in the list, the atlas of Guangdong province. Apart from the Selden Map, this is the one that I have had most to do with recently, as a couple of years ago I chose it as one of the objects to show to the visiting Governor of Hainan, a province that was created as recently as 1988. Until then, the island had been part of Guangdong province, and from 1944 was known as Hainan Dao 海南島. Before that it was called either Qiongzhou 瓊州 (after its ancient name of Qiong 瓊, meaning a special sort of jade), or Zhuya 珠崖 (after the pearls that abound on its northern shores). The atlas is a luxurious product, its leaves mounted on stout cards bound “album” style between wooden boards covered with silk brocade. It has a very high aesthetic appeal, evidenced in the depiction of mountains, precisely and in vibrant shades of blue and green; the use of subtle colour wash; and the precision of the calligraphy, which is sometimes almost unbelievably small. It was scarcely possible to show the atlas to a visitor without knowing its date, and so I set about finding it. If the truth be told, my main interest in this document was simply in cataloguing it as accurately as possible in the absence of any names or dates in the text. 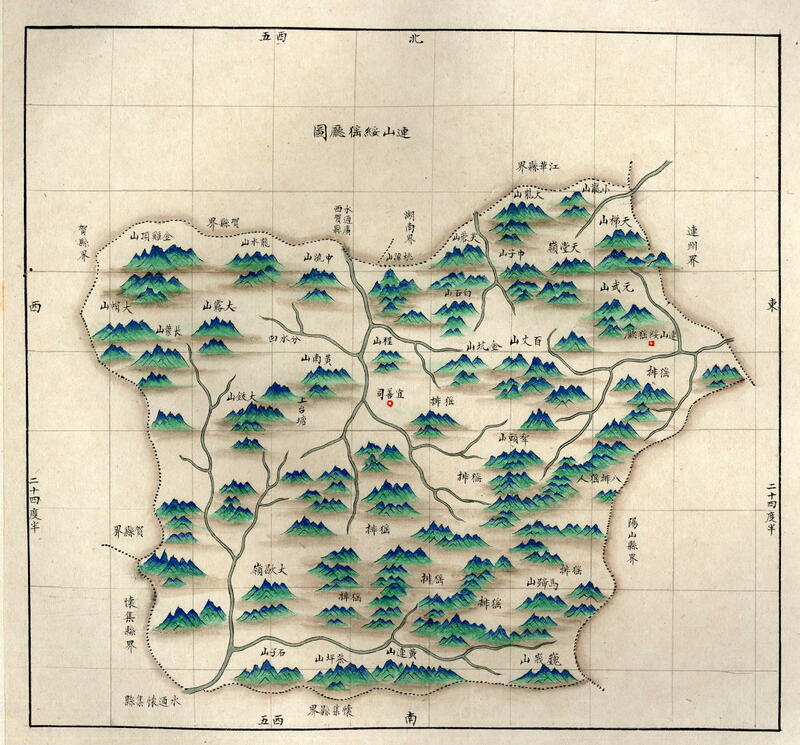 Although Li Xiaocong did not see this atlas, he described a printed map with the same title in the British Library, Maps 61670(1), (p.335-336). 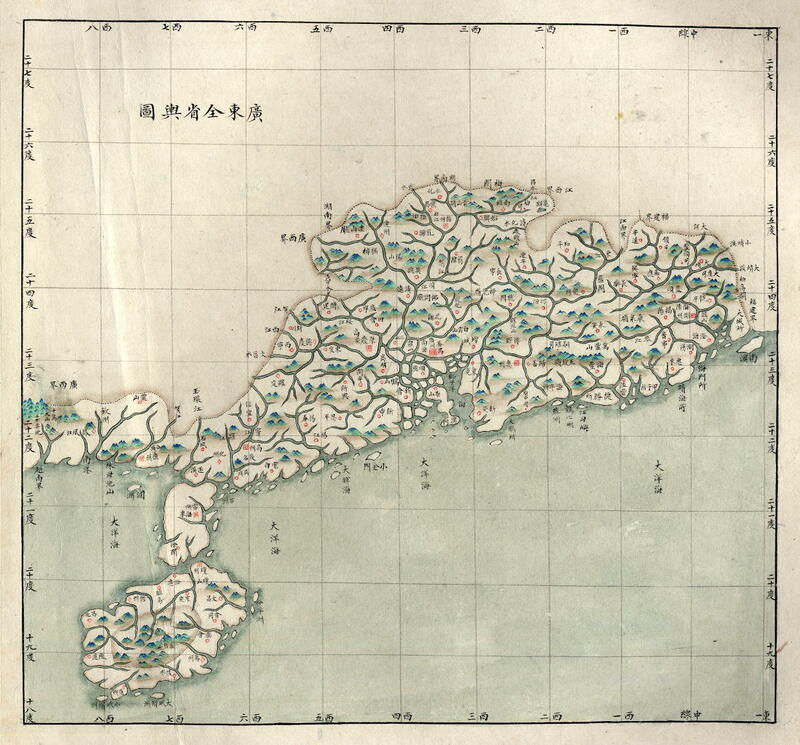 It seems that this and other maps described in the Guangdong section of Li’s catalogue and the Bodleian atlas are somehow related, as they all reproduce a major error in the depiction of the Leizhou Peninsula 雷州半島, showing it cut off from the mainland by a strait just south of Suizhou 遂州. No meaningful terminus post quem non can be established by the date of its accession, as we can tell from its original shelfmark (Chin.c.3) that it must have entered the Library only in or shortly after 1885.